When it comes right down to it, you really only need to know two methods to graft most young fruit trees. 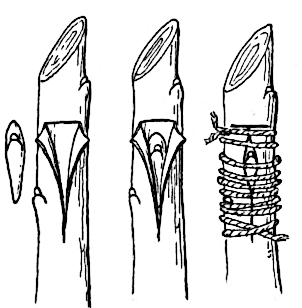 The whip and tongue graft is the simplest, appropriate for young apple and pear trees grafted onto rootstock the same pencil-thickness as the scionwood. Budding is used if you have very little scionwood to go arond or if you need to graft a cherry, plum, apricot, or peach, none of which are reputed to respond well to whip and tongue grafting. Budding is also less sensitive to the scionwood and rootstock having different diameters. A whip and tongue graft joins the scionwood to the top of the rootstock using a slanting cut to increase surface area and a notch (the tongue) to help the two pieces stay in place as you tie them. Select a point about four to eight inches above the ground on the rootstock, where the diameters of the two pieces of wood match, then make a cut six times the diameter of the wood (says Garner), or roughly an inch and a half long (says Phillips). You'll want to practice until you can make a cut with no bulges or raggedness, then focus on lining up the tips and the cambium all around so that there's an 80% visual match. Add the tongue (a 1/8 inch cut into each piece of wood), then trim the scion to two buds before slipping the joints together. After making the cuts for a whip and tongue graft, you'll want to wrap the new tree with some kind of binding material to hold the junction firmly in place. Start at the bottom and leave space between loops as you circle up to ensure you haven't gotten the pieces out of alignment, then cover everything up by taping back down over the junction. Add some sealant on the tip and over the tape and then plant your new tree out in a garden bed for the first year. In early June, the buds on the scionwood should have sprouted and the longest should be at least two to four inches long; that's your cue to pinch the tips of all but the best shoot and to remove any rootstock growth. These instructions assume you're followed the American trend of bench grafting (which simply means you dug up rootstocks and took them inside to graft), in which case you probably joined your rootstock and scionwood between December and March. If grafting onto a rootstock in the field, you'll want to wait until the week before the first green shows on the buds so that winter's cold won't damage the new union. 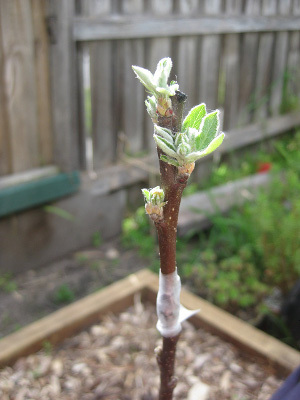 In contrast, bud grafting is generally completed in the summer, between June and early August. There are many types of bud grafts, but shield budding is most common. First, prepare the rootstock by making a T-shaped series of slits in its bark, then slide in a carefully prepared bud shield. The bud comes from the leaf axil of the current season's growth and consists of the bud and the leaf stem. After slipping the piece of scionwood under the rootstock's bark (with the bud itself sticking out), you tie the two together and seal the wound, but don't cut off the top of the rootstock yet. Instead, you let the bud heal into the young tree, sometimes waiting until the next year to tempt the scionwood to grow. Once it's time to force the bud, slowly remove leafy shoots of the rootsock a few at a time, or bend down the top of the stock so the scion bud is the highest one on a curved stem. After the bud begins to grow well, you can cut off the top of the rootstock so the scionwood takes its place. I've used whip and tongue grafting before and found it relatively simple, but haven't tried budding yet. How about you? Are there other grafting techniques you recommend for the beginner? My full color paperback will be shipping soon to folks who preordered. I don't have any space for my own fruit trees, but when I learned to graft the instructor swore by cleft grafts as the simplest grafts and claims to have had real success. He also uses a stretching tape ("tommy tape") from ace hardware to seal them so that they don't strangle themselves before you remember to take off the tape. Nichole --- Glad it helped! Scionwood can keep for several weeks, or even months, as long as it's stored in a cool, damp place (like a root cellar). People regularly take it in January or February for grafting in March and April. There's quite a vibrant community of scionwood swappers who send the wood through the mail, and I've had good luck with that too. Here's my most recent post about how to mail scionwood. Good luck!